HYUNDAI-Sime Darby Motors (HSDM) launched its 1.6L Veloster Turbo sporty coupe, featuring Hyundai’s latest cutting-edge technology at its new Global Dealership Space Identity (GDSI) boutique showroom in Bangsar last Friday. The Veloster Turbo, which combines a high-compression, twin-scroll turbocharger and a GDI (gasoline direct injection) system, is also the first Hyundai vehicle to be fitted with the 1.6-litre T-GDI engine which delivers more power, superior efficiency, lower emissions and higher reliability. Producing 186hp and 265Nm of torque, the 1.6L Veloster Turbo delivers a top speed of 214kph and acceleration from 0-100kph in 8 seconds. Maximum torque is delivered between 1,500rpm and 4,500rpm, resulting in a more engaging and responsive drive while firmer dampers ensure improved body control. Mated to a 7-speed dual-clutch transmission (DCT) that is developed in-house by Hyundai Motor Company, the Veloster Turbo features steering wheel-mounted paddle-shifters and the Shiftronic® transmission gear control which is performance-tuned and specifically engineered to handle the increased torque from the turbocharged engine. The Veloster Turbo’s 7-speed DCT was tuned especially to achieve higher torque and performance calibration. 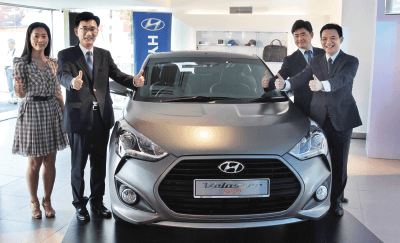 “The 1.6L Veloster Turbo model demonstrates Hyundai’s innovation in powertrain technologies, optimising the appeal to youthful customers by combining excellent fuel economy, spirited performance and low emissions without compromise,” said HSDM managing director Lau Yit Mun. Driving comfort has greatly improved with the incorporation of the flex steer system on the steering wheel that enables drivers to choose from normal, comfort or sports mode. The hood insulator pad and added acoustic absorption material contribute to cabin quietness. The 1.6L Veloster Turbo is further enhanced with new high-intensity discharge projector headlamps coupled with daytime running lights, radiator grille and new LED rear light. The rear bumper is redesigned with rear fog lamps and it is also sportier than ever with the inclusion of round twin exhausts, a diffuser as well as a longer and wider rear spoiler that comes integrated with a LED brake light. The Veloster Turbo is also fitted with a new 18-inch alloy wheel design. Inside, there is the supervision gauge cluster that feeds the driver information on a larger, clearer screen located between the tachometer and speedometer. Like all Veloster models, the Turbo variant includes standard keyless entry with push-button ignition, 60:40 folding rear seats, a 7-inch colour thin film transistor touch pad display, incorporating premium sound system (six speakers, a central speaker and a subwoofer) and panorama sunroof. All Velosters feature a reverse parking camera with parking guidance. Customers can also opt for the 1.6L Veloster Turbo Sport variant for a sportier look with new sports seats in two-tone colours of orange and black. The Veloster Turbo also features the latest safety technologies to ensure maximum protection for its occupants. It has an exceptional level of standard safety features that help the driver maintain control of the vehicle in slippery road conditions, during fast cornering and steep ascents. All Veloster variants are also fitted with six airbags, including dual front, front seat-mounted side impact, and front and rear side curtain airbags. Apart from the Turbo edition, the Veloster is also available with a regular 1.6L Multi-Point Injection engine which comes only in the Premium variant. All Veloster models are fully imported from South Korea. This article first appeared in The Edge Financial Daily, on April 20, 2015.